"This love of baseball goes way beyond her now being married to current San Diego Padre David Eckstein. 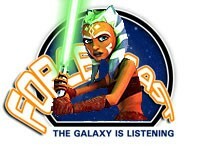 She sees some of America?s past time in the character she plays on Star Wars: Clone Wars, Ahsoka Tano. ?I definitely relate to Ahsoka in a lot of ways,? says Eckstein. ?Now I?ve grown and become more of a girly girl, but at times deep down we?re both tomboys. Ahsoka is who I was when I was her age, 14. You couldn?t get me to wear a dress. I just wanted to be like my older brother and hang with the boys. Make sure to hear Ashley (with special guest David Eckstein) in the Force-Cast Cantina from last November, in case you missed it!